The deadly derailment of a Metro-North train in New York City has revived discussion of the widely embraced "push-pull" method of switching commuter trains' directions after they've reached the end of their lines. The practice, first implemented decades ago, allows a locomotive to pull a train toward one destination and push it on the way back, sparing the time and expense of turning the train around. All of the nation's major commuter lines do it. Rail operators can't imagine how they'd manage without it. 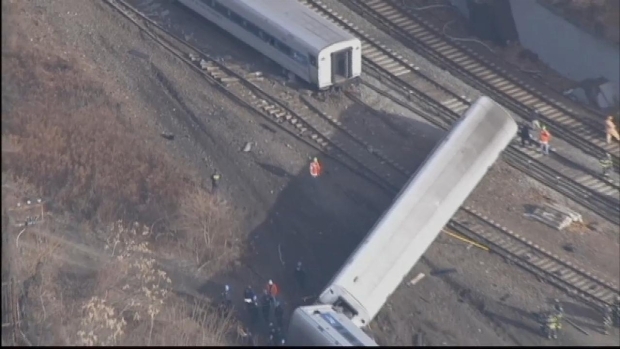 But whenever there is a major crash involving a train in the push mode, like Sunday's crash that killed four and injured more than 60, there are renewed questions about the safety of the method. Among experts, though, there really is no doubt: pushing a train rather than pulling it doesn't make an accident more likely, or the result much worse. Dennis O'Neil, a passenger on board a Metro-North train that derailed Sunday morning in the Bronx and left four people dead, and 63 injured, said he knew something was wrong before the train car he was riding in flipped over. "I don't think the outcome would have been any different," former Federal Railroad Administration engineer Gordon Davids said of the crash in the Bronx on a holiday weekend. "The cars might have rolled in the opposite direction had the train been pulling, but the fact is I think they would have rolled and we probably would have had the same injuries," said Augustine Ubaldi, a railroad engineer and consultant for Robson Forensic. The pushing of trains has "been done for more than 50 years without any significant problems," said Steven Ditmeyer, professor at the Railway Management program at Michigan State University. A similar debate erupted in 2005, after a commuter train in push mode got into a collision that killed 11 people in Glendale, Calif. Afterward, officials imposed a rule that prohibited passengers from sitting in the first 11 seats of a car at the front end during push mode. Among engineers and investigators, the move was seen as unnecessary. "It was a knee-jerk reaction," said Rick Gallant, who was the lead investigator for California's railroad regulatory agency at the time. Gallant pointed out that Metrolink, the agency that made the rule, has since abandoned it. At least four people were killed and several more were critically injured when a Grand Central-bound Metro-North train derailed in the Bronx early Sunday. "I don't think there's a commuter railroad in the country that leaves the first 11 rows," said Gallant, who is now a vice president for commuter rail operations at Transportation Certification Services in Kansas. After the Glendale crash, the Federal Railroad Administration conducted a study that concluded trains in push mode had slightly higher rates of derailments, but the difference was so small that it didn't justify eliminating the practice. Gallant, along with other experts, acknowledged that, in the case of a head-on collision, it is preferable to have a heavy locomotive rather than a car full of passengers bear the brunt of impact. But they emphasized that the forward-placed cab cars are built to withstand tremendous force. "The main reason you don't have more casualties in passenger trains today is that riding in one of those cars is like riding inside a piece of pipe," Davids said. Gallant added that the Metro-North disaster probably could have been avoided if a new technology called positive train control had been in place. The system can automatically slow a speeding train, but it is only in testing mode and won't be mandated on commuter rail lines until 2015. Last month, the MTA approved $210 million to design a positive train control system for Metro-North. In a press conference Monday on the Metro-North derailment, U.S. Sen. Charles Schumer was asked about the push-pull issue, and said he'd talked about it with investigators who assured him pushing was just as safe as pulling. The search for a cause, meanwhile, has turned to the train's speed, which the NTSB said was clocked at 82 mph as it went into the deadly turn, a location where the speed limit was 30 mph.